One of the joys of Twitter is connecting with new people. One of my Twitter friends includes Prelude to a Nightmare, who I’m rather embarrassed to admit that I did not realize he did music until quite recently. Hey, our Twitter feed is very busy and it’s easy to miss stuff. After seeing a Tweet discussing his upcoming music, I looked him up on Amazon to see if any of his work fit in with the planned themes for this year’s “season” of the Gravedigger’s Local 16 music podcast. I quickly realized that he specialized in the very sort of album “Music to Haunt By” is devoted to and knew I had to get my hands on it. 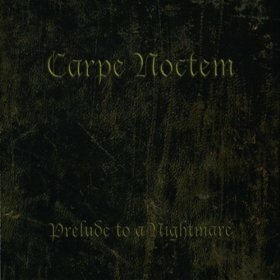 The debut album Carpe Noctum takes its name from a fictitious book of evil mentioned in the liner notes. Things start off with the self-titled “Prelude To A Nightmare,” which features a mix of female chanting, soft wind effects and a combination of music and string work. It’s spooky and sweeping in tone and also has a “cinematic” feel to it. An opening door and footsteps usher in “Time Forgotten,” whose soft music gradually increases in volume. A harpsichord provides a feeling of antiquity, while the organ provides the horror aspect. Both are gradually replaced with more footsteps. I can easily see this being used for when visitors enter a scene, perhaps something that has a medieval theme. “The Terror Within” has a big opening, with tolling bells and a very spooky musical stinger. What seem to be muffled voices and soft, mysterious music yield to industrial music. Chanting appears later on, along with more bells in the distance. This would work well in haunted club, factory or boiler room scene and its length makes it very suitable for looping. “Playful Spirits” is shorter, but still loopable. As you can imagine, this is perfect for a “haunted nursery”-type scene and features plenty of music box sounds and spooky effects, like a child whispering, layered over soft music. The strong piano opening of “Phantoms In The Attic” leads to violins and wordless female vocals, which make it perfect for looped use in a haunted attic scene or any other spooky setting. There’s also some music box-like chiming, which could make it useful in a haunted nursery or circus scene in a pinch. “Hallowed Grounds” features a slow, soft build of music and extra soft chanting. The tolling bells and violin work are a great match, and the bats squeaking at points are a great touch. Its solemn, scary feel make it perfect for a graveyard or crypt scene. Soft piano work starts off “Full Moon” as bells toll in the distance. In addition to some ethereal female vocals, there’s a cool musical stinger that brings in a nervous tone to the piano. The percussion offers an almost jaunty tone that the bells take us out of it all…temporarily. There’s also a kind of tribal feel in the second go round. Screaming in the distance opens “The Tormented.” The very soft music is dominated by sound effects like distant voices and dripping, which give this track a very scary tone. As you can guess, this is perfect for use in a dungeon or torture chamber scene. “Eternal Darkness” starts with the rising of soft violins, along with pounding percussion and wordless female vocals. There are some nice variations on tolling bells and our old friend the stinger reappears at one point. “Deepest Despair” definitely lives up to its name, especially thanks to the opening piano work. Spooky effects and an industrial feel come later, as does some great organ work. While many tracks off the other albums in this series have a timeless feel to them, this track sounds like something from a modern day horror movie. “Death’s Lament” features a mix of soft mournful piano work and wordless female vocals that make for an effective combination. If your graveyard setup features an “Angel of Grief,” this would work perfectly with it. I suggest playing it at such a volume that you can’t hear it until you get near the weeping angel. While its length makes its well suited for looping (like all the tracks on this album), there is another way to use it: set up a motion sensor connected to an audio player so that the track plays once someone gets close to it. Along with the spooky wind and bells, “Midnight Requiem” has an industrial feel in which stingers abound. There’s also some gong work, which works surprisingly well with the feel. “Final Breath” has a soft, speedy/frantic feel to its opening, while much of the rest has an industrial feel. There’s also an interesting section involving a mournful piano and chanting. As you may have guessed, this would work great in a haunted club, factory or boiler room scene. There’s also a bonus track called “Subterranean Terror” which is an amazing soundscape featuring effects like whistling wind, whispers, squeaking rats and dripping. It’s perfect for a haunted cave scene or dark maze! Although it’s all for that particular album, it’s far from the end of Prelude to a Nightmare. There’s a short single from the album Dark Ride and an atmosphere album called Gothic Nightmares now available on iTunes and the album Unreal will be released this spring. During the spring, the man behind the music will be attending the Midwest Haunters Convention and Hauntcon, in addition to lecturing at the Canadian Haunted Attraction Conference in April 2012. As if that wasn’t enough, he’s also formed Scare Tactic Productions! UPDATE: The track “Subterranean Terror” has been removed from the reissued digital download version of this album. Why? Because it was expanded and moved over to the release Gothic Nightmares from the “Sinister Sounds” spin-off line! Special thanks to Prelude to a Nightmare for the review copy!